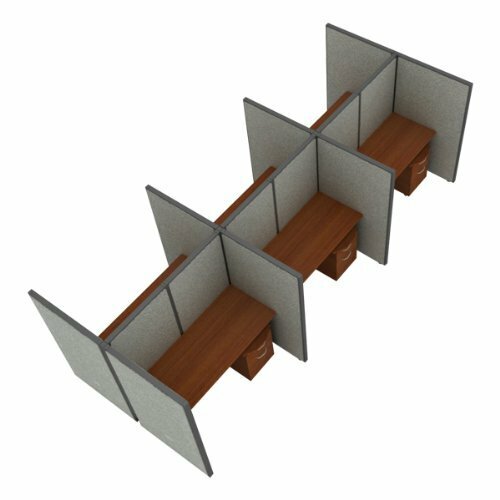 For privacy in close quarters, use OFM's Rize Series Privacy Stations in Two by Three Configuration with Full Panel. Each individual space is enclosed by three easy-to-clean vinyl panels; hang them onto frame hooks for quick installation. Hang them onto frame hooks for quick installation. Steel frames are a cinch to set up; simply attach them to one another with screw-in knobs. A wire management system keeps cables organized and out of the way. Store files and supplies in the included pedestal drawers. Choose the desktop and vinyl color you prefer. View More In LAN Stations. If you have any questions about this product by OFM, contact us by completing and submitting the form below. If you are looking for a specif part number, please include it with your message. Vinyl Floor RiZe Panel with Translucent Tops Color: Beige, Size: 47" x 31"